Seasons 52 stands by it’s name – every season, for 52 weeks out of the year, they change up their menu to usher in the latest, top-notch seasonal ingredients. You may remember my past posts on their fall menu and past winter menu. 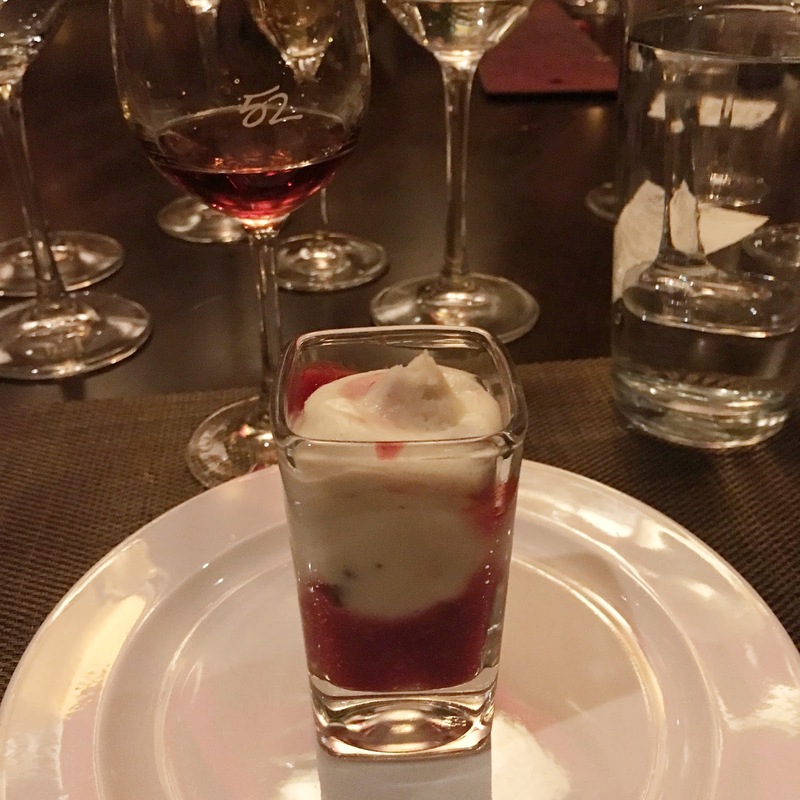 I was honored to try their Spring tasting menu recently, so read on to see how it is this year! We started with the Chef’s Spring Amuse Bouche, paired with Aveleda Vinho Verde, Portugal ’14. I really enjoyed this dish, which centered around grilled tofu. I could have eaten all of them, but was polite and only had one … or two! The sweet Aveleda wine was my favorite of the night, which makes sense considering the sweet Pino Bianco was my favorite back when we went wine tasting at a castle for New Years. Next, they brought out their signature flatbreads. This spring brings us a lobster + fresh mozzarella, as well as crispy prosciutto + asparagus option. Unfortunately since I’m gluten free I didn’t get to try these! 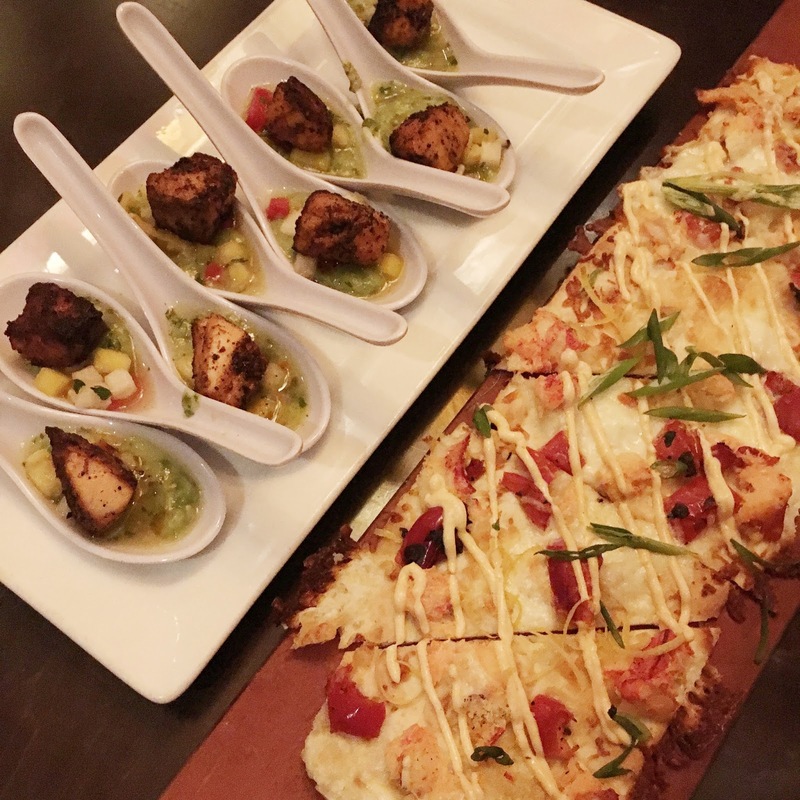 Seasons 52 actually does have a great gluten free menu, and at the last tasting they made accommodations for dietary restrictions, but this time around they seemed to have forgotten. Womp womp! These were paired with the Chartogne-Tallet Cuvee Saint Anne, Champagne MV. I love the bubbles in champagne so this was another favorite for me. 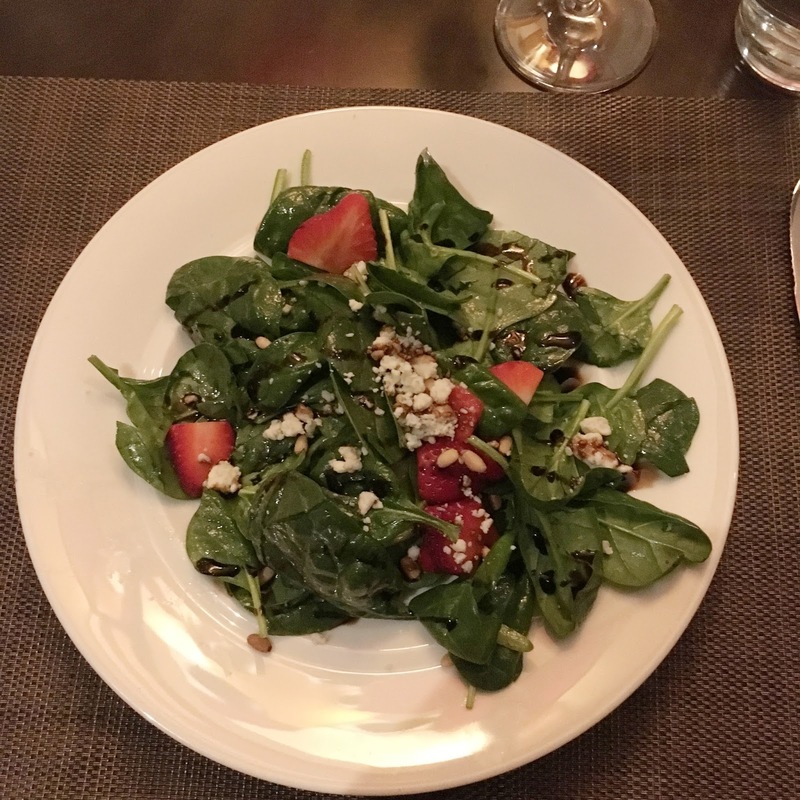 The second course was the spinach salad seen above, with spring strawberries, pea tendrils, toasted pine nuts, gorgonzola, and 15-year aged balsamic drizzle. Sadly, this plate was underwhelming for me. The spinach was limp and sad, though the strawberries were nice and ripe. It was paired with the Tilia Torrontes, Salta ’14/’15. The third and fourth course came out together. 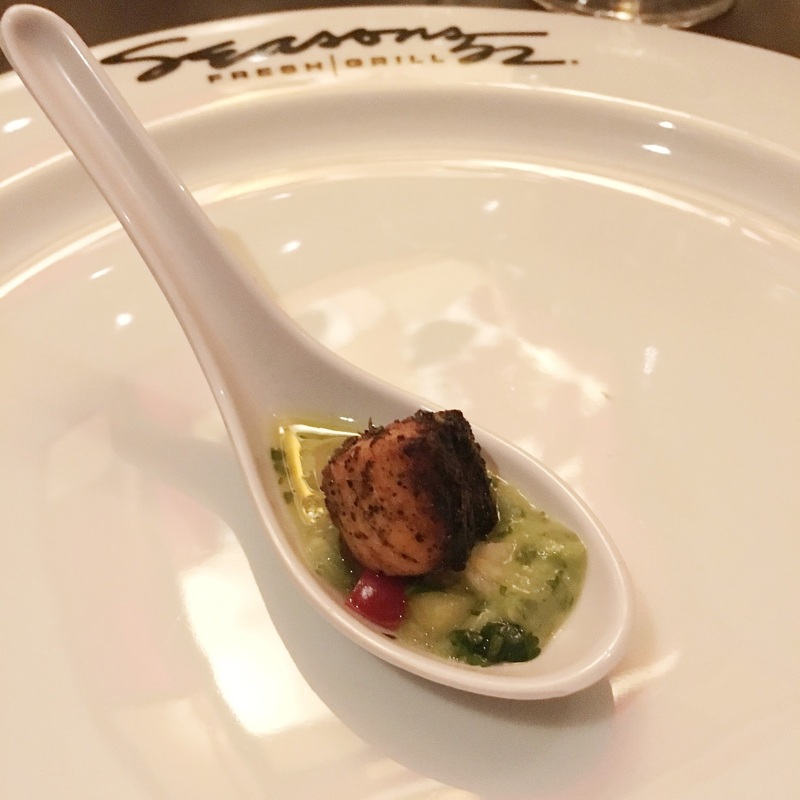 I was completely enamored with the caramelized grilled sea scallops with lemon risotto! I’m going through a big sea scallop phase right now as well as just learning how amazing and comforting risotto is, so a combo of the two is my favorite dish ever! I just wish there was more risotto on the plate. It was paired with Mer Soleil, Central Coast ’13/’14. The fourth course was the meyer lemon ricotta ravioli, with brown butter, roasted peppers, and English peas. Again, since I’m gluten free I was so bummed I couldn’t try these, but everyone at the table said they were amazing so I would still recommend them! Sinskey, Carneros ’12 was served with this dish. For the fifth course we had a choice between lamb (above) and sea bass (below). 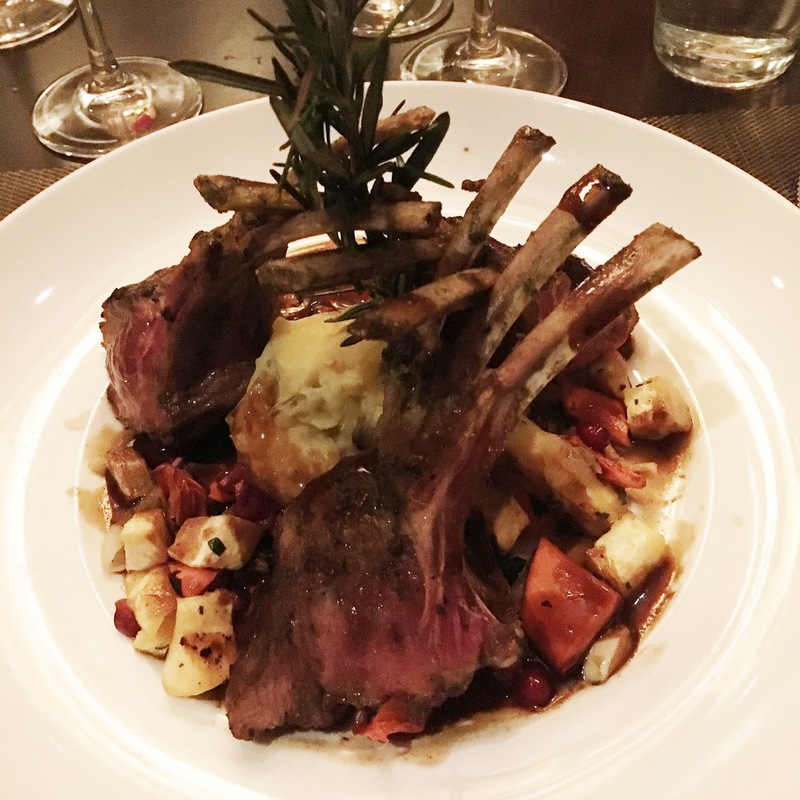 I went with the wood-grilled rack of lamb, which came with spring veggies, yukon gold mashed potatoes, and shallot jus. The lamb was so delicious, as was the mashed potatoes sauce it came with. At one point I dropped my steak knife, and resorted to using a nearby butter knife, and it still easily cut through the lamb – that’s how tender it was! This was served with De Toren Fusion V, Stellenbosch ’12/’13. 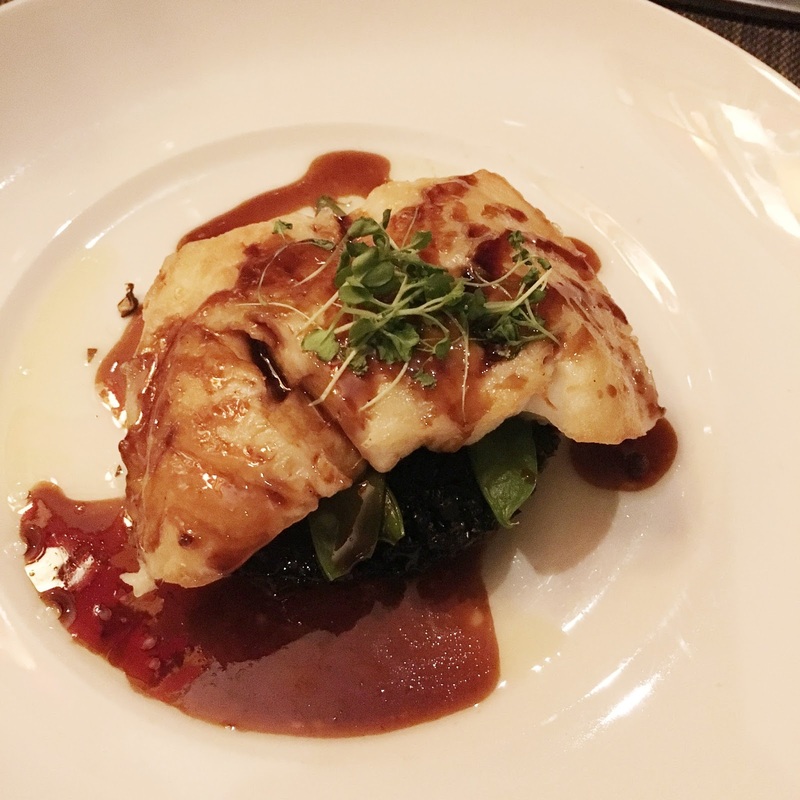 Above is the Asian-glazed Chilean sea bass, with organic black rice, snow peas, and shiitake mushrooms. I tried a bite of this dish as well and absolutely loved it. The sauce basically tasted like teriyaki to me. It was served with Selbach-Oster, Mosel ’14. *Drumroll please* I give you the mini indulgence desserts – a staple at Seasons 52. Yes, those are smore’s up there too. The raspberry cannoli cup (sans cannoli itself) is actually gluten free so I definitely chowed down on that one! It was sweet and scrumptious, as I can only imagine the rest are as well! I just love this presentation too. It’s the most decadent tower I’ve seen. Desserts were paired with the Selbach-Oster Berkasteler Badstube Riesling Auslese, Mosel ’10/’13. I would have liked to see a crisper salad, and it would have been nice to have all of our dietary restrictions accounted for, but all in all the dishes were delicious and the service was attentive. 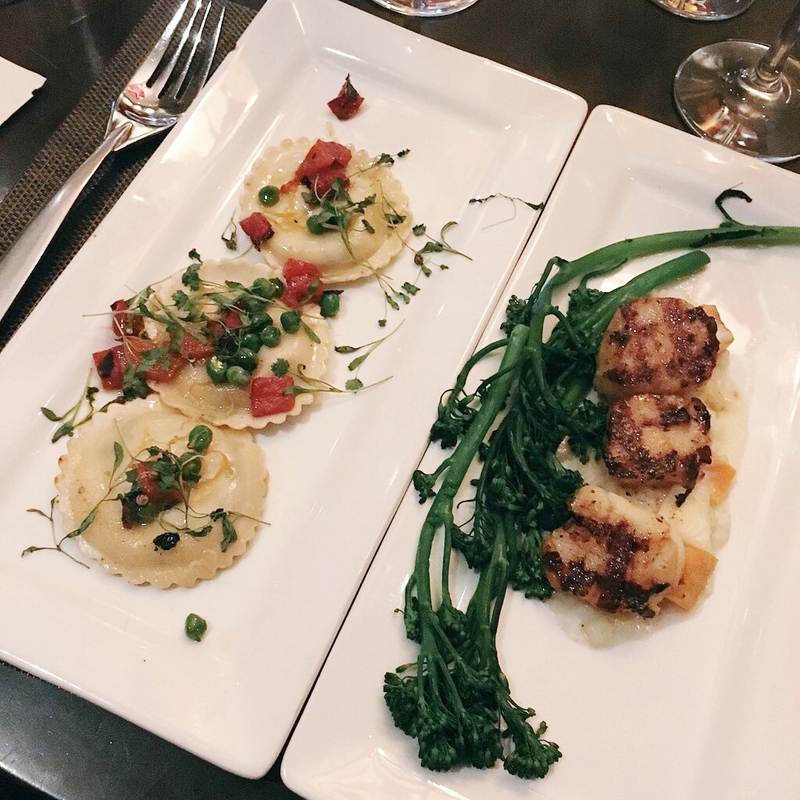 I would definitely recommend dining at Seasons 52 and checking out their spring menu for yourself! 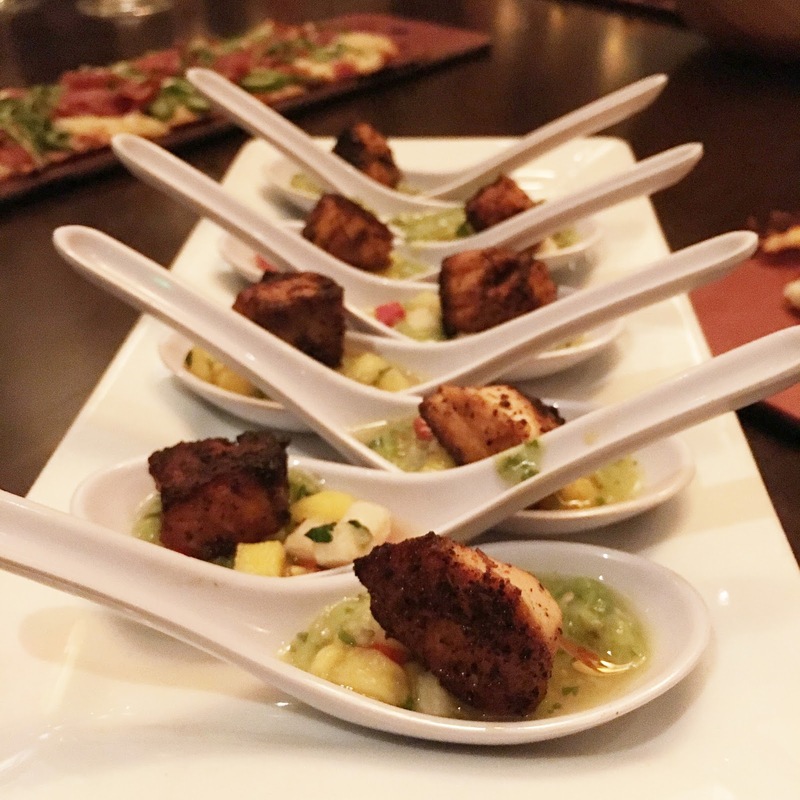 Check out the past Seasons 52 tasting menus, and be sure to head over to my food section for more delicious restaurant reviews! Comment Challenge: What are your thoughts on Season 52’s springtime menu? *Note: This is a sponsored post, all opinions are my own. Thank you for supporting those who support Chow Down USA!